What does a stay at home mom whose side business of refurbishing furniture and fixing up home decor takes off? If she's Kelly Grassman, she buys an old building and opens a store. Grassman and her husband, Gary Grassman, opened Mount Angel Mercantile on Friday. The store, located at 490 E. Church St., is nearly 120 years old and was a general store for decades. Up until just a couple years ago, the building housed the White Corner Store, which was a gift and antiques shop. For about four years, Grassman has run a small business from home, Vintage Ladder, through which she sells furniture and home decor she has refurbished after buying them at estates sales and thrift shops. When Grassman, who lives just a couple blocks away, passed by the empty building, an idea came to her. "I never intended to have a storefront," she admitted. "But I was driving by the building, and it was a voice that said you need to look into that building and find out who owns it and see if they want to rent it. The voice was persistent." She found the owners — the building has been in the same family for generations — who were hesitant to sell, knowing the roof was leaky and the electrical needed lots of work. That didn't faze Grassman. "They came back and said, you know, no one in the family wants it and it's just sitting there and if you guys aren't going to tear it down and destroy it then sure, you can buy it," she said. Immediately, the new owners got to work on the new roof and updating the electrical and plumbing. 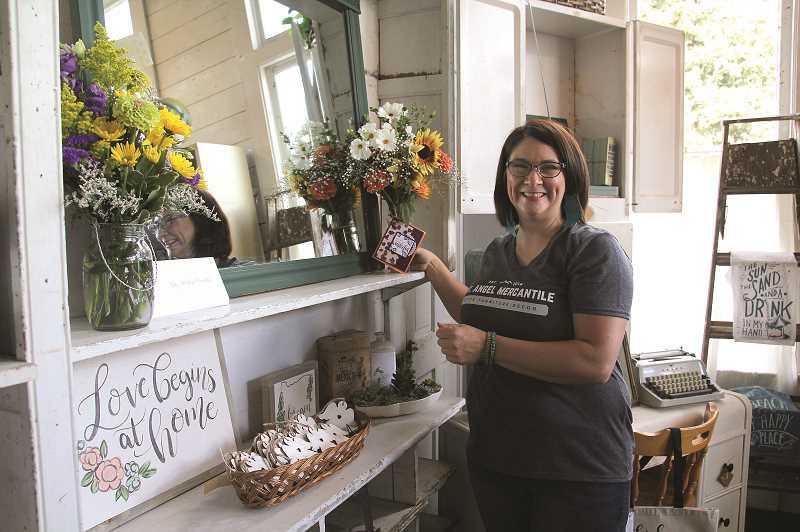 With the bones of the structure all set, Grassman got to work on the 1,000-square-foot store space for her new business, which features country farmhouse furniture, home decor items, giftware, metal artwork and more. "Most of the stuff in here is from small makers," Grassman said. "It's handmade stuff, but it's more unique than what you find in stores like Hobby Lobby; it's more curated. We have more of a rustic element that you wouldn't see in a (big chain store)." Most of the furniture in the store has been built, painted or fixed up by Grassman herself, while the giftware and small items are from women business owners of the Pacific Northwest. "That was one thing I wanted to focus on: women creators," she said. She also hopes to expand the business and include creative classes like wreath making and maybe consultations. Mount Angel Mercantile's store hours are currently 10 a.m. to 4 p.m. Friday through Sunday. The store will be open from 10 a.m. to 6 p.m. all four days of Oktoberfest. Check out the Facebook page "Vintage Ladder" and follow "Mt. Angel Mercantile" on Instagram. Now that the store is open, the Grassmans will start looking toward phase two. "The big push was to get the store open for Oktoberfest and getting it water tight," Grassman said. The building also has a private living space above the store that the Grassmans are planning to transform into an inn. "It's different from a bed and breakfast because we're not going to be serving food; but we want to send them to our downtown restaurants," Grassman explained. The goal is that the White Corner Inn, which will include four bedrooms decorated in a rustic farmhouse or cottage style, will open by next summer. Follow White Corner Inn on Instagram to get updates on the inn's progress.